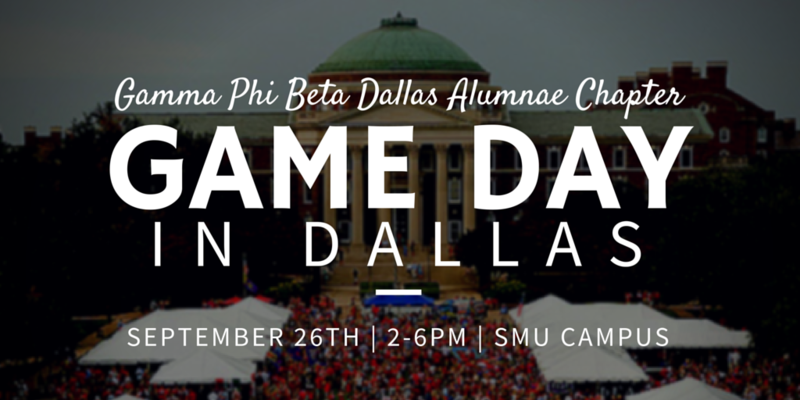 We welcome all Gamma Phi sisters in the Dallas/Fort Worth area to join us for a tailgating/boulevarding experience for a Dallas game day at SMU. Everyone is welcome, including friends and family! We will have a tent on the boulevard (tailgating area at SMU) with food and drinks (beer, wine, soda, and water). Our spot number is #208 and we will have our Gamma Phi Beta Dallas Alumnae banner above the tent. Parade begins at 3pm, so we suggest if you want to see the parade, to arrive between 2:00 - 2:30PM. We ask everyone that enjoys the tent pay $10 to help cover the cost ($5 for children). Please bring money/payment onsite to the event (cash or check preferred). Parking: Parking will be very busy during the day. There are several garages on campus that will be available for paid parking. You may also find street parking in the surrounding areas or ride the DART train to Mockingbird station and walk across the street to campus. RSVP: Please RSVP below & make payment at the event. RSVP for Game Day in Dallas! Please RSVP below and make payment at the event (cash or check preferred).